Contains milk, egg, and soy. Dymatize Complex Carbohydrate Blend (made up of the highest quality corn dextrins available from maltodextrin providing ultra high levels of 100% pure long chain glucose polymers), Dymatize Sustained Release Protein Blend (Whey Protein Isolate, Whey Protein Concentrate, Calcium Caseinate, Egg Albumin, Milk Protein Concentrate), Fructose, Quic Creamer: [Soybean Oil (genetically modified), Corn Syrup Solids, Sodium Caseinate, Mono- & Diglycerides, Dipotassium Phosphate, Sodium Silico Aluminate], Natural and Artificial Flavors, Dymatize Super Mass Gainer Vitamin and Mineral Blend (Potassium Chloride, Vitamin A Palmitate, Vitamin D3 (Cholecalciferol), Calcium Phosphate, Sodium Ascorbate, Vitamin E (D-alpha Tocopheryl Acetate), Niacinamide, Pantothenic Acid, Zinc Oxide, Pyridoxine Hydrochloride, Thamine Hydrochloride, Folic Acid, Biotin, Riboflavin, Potassium Iodide, Cyanocobalamin, Chromium Chloride, Sodium Selenite), Silicon Dioxide, Red # 40, Acesulfame Potassium. 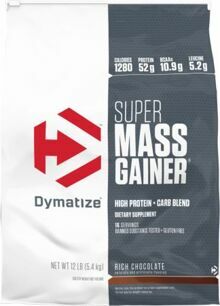 As a dietary supplement, add 2 scoops of Dymatize Super Mega Gainer to 24 oz of cold water or milk. Mix thoroughly. Dymatize Super Mass Gainer is highly concentrated, and due to its potency you may want to consider using 1/2 serving two or three times throughout the day. Maltodextrin, Protein Blend (Whey Protein Concentrate, Milk Protein Isolate, Whey Protein Isolate, Whey Protein Hydrolysate, Micellar Casein, Egg Albumin), Cocoa Powder(Processed With Alkali), Sunflower Creamer (Sunflower Oil, Sodium Caseinate, Mono & Diglycerides, Natural Tocopherols, Tricalcium Phosphate), Fructose, Natural And Artificial Flavors, Vitamin & Mineral Blend (Tricalcium Phosphate (Calcium), Sodium Ascorbate (Vitamin C), D-Alpha Tocopheryl Acetate (Vitamin E), Niacinamide (Vitamin B3), Retinol Palmitate (Vitamin A), Calcium-D-Pantothenate (Vitamin B5), Potassium Iodide (Iodine), Folic Acid (Vitamin B9), Pyridoxine Hydrochloride (B6), Thiamine Hydrochloride (Vitamin B1), Riboflavin (Vitamin B2), Cyanocobalamin (Vitamin B12)), Gum Blend (Cellulose Gum, Xanthan Gum, Carrageenan), Potassium Chloride, Salt, Acesulfame Potassium, Sucralose. Maltodextrin, Protein Blend (Whey Protein Concentrate, Milk Protein Isolate, Whey Protein Isolate, Whey Protein Hydrolysate, Micellar Casein, Egg Albumin), Sunflower Creamer (Sunflower Oil, Sodium Caseinate, Mono & Diglycerides, Natural Tocopherols and Tricalcium Phosphate), Fructose, Natural and Artificial Flavors, Vitamin & Mineral Blend (Tricalcium Phosphate (Calcium), Sodium Ascorbate (Vitamin C), D-Alpha Tocopheryl Acetate (Vitamin E), Niacinamide (Vitamin B3), Retinol Palmitate (Vitamin A), Calcium-D-Pantothenate (Vitamin B5), Potassium Iodide (Iodine), Folic Acid (Vitamin B9), Pyridoxine Hydrochloride (Vitamin B6), Thiamine Hydrochloride (Vitamin B1), Riboflavin (Vitamin B2), Cyanocobalamin (Vitamin B12)), Gum Blend (Cellulose Gum, Xanthan Gum, Carrageenan), Potassium Chloride, Acesulfame Potassium, Sucralose. Contains milk, egg, and soy (lecithin).